The ultimate proposal package with a private luxury cruise including flowers, cheese and wine then step off at the romantic Botanical Gardens for privacy to pop the question and then sit back and relax and enjoy the amazing views. 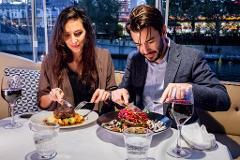 Indulge and enjoy a private dinner cruise on Melbourne's spectacular Yarra River for you and your partner. 2 hour Self-Drive Hire - Harvey A - For up to 10 People - No license required! 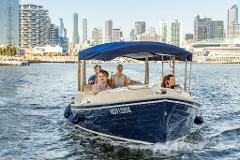 Enjoy Melbourne on-board our eco-friendly luxury self-drive hire boats from as little as $29.00 each with you and 9 of your friends for 2 hours. No experience or boat license required! 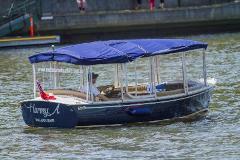 2 hour Self-Drive Hire -Eliza J- For up to 12 People - No license required! 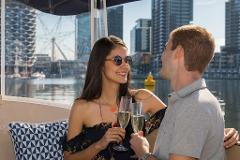 Enjoy Melbourne on-board our eco-friendly luxury self-drive hire boats from as little as $29.90 each with you and 11 of your friends for 2 hours. No experience or boat license required!